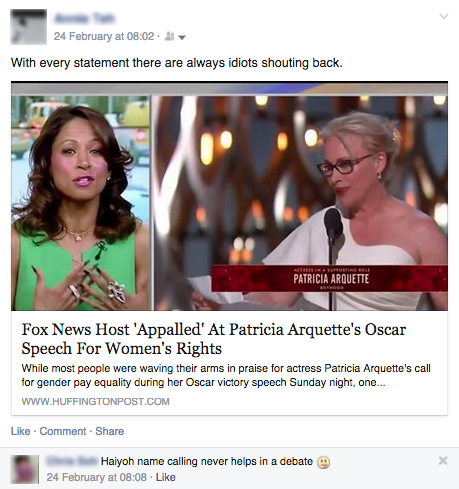 The other day, I posted an article on my personal Facebook page about a Fox News Host who responded to Patricia Arquette’s call for gender equality in wages. Long story short, host and actress Stacey Dash had said that the Equal Pay Act has been in effect in the US since 1963, and that Arquette needed to “do her history”. Feeling vilified, I had posted a Huffington post article about the incident on my Facebook page with the caption, “With every statement there are always idiots shouting back”. To which, a friend replied that “name calling never helps in a debate”. I was stunned. And as the words sank in, I admittedly felt ashamed. We had — just the day before — been talking about the negativity that the Internet Culture brings, and I had, a day later, contributed to it, albeit unknowingly. I immediately went into defense mode and tried to justify myself in my mind. But as much as I could come up with reasons why Stacey Dash is a plague on feminism, and how she deserved to be called an idiot, I couldn’t change the fact that I had just become one of the many people throwing cowpies at celebrities and people in the public spotlight, while hiding behind the Internet. While we celebrate the Internet as a place to speak our minds and share our opinions, where do we draw the line between participating in the greater discussion and simply lavishing in the freedom of anonymity? Many movements have already begun to promote more positivity on the internet. 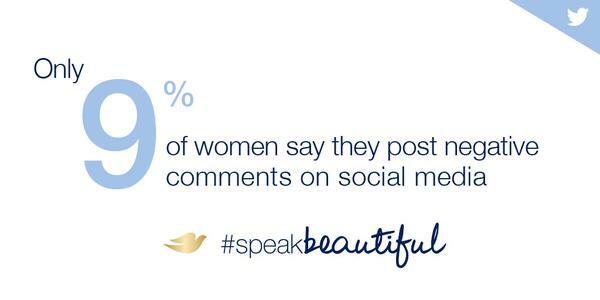 During the Oscars, Twitter and Dove launched a #SpeakBeautiful campaign to support the use of positive words on social media, instead of the negative words that we often see. According to Dove, the word “ugly” was tweeted 169,480 times in the 15 hours since the Oscar’s red carpet. Such movements are also picking up speed in Singapore. Singapore’s Internet positivity movement Broll Face has launched Broll Day, with the support of Singtel, to spread awareness about being a Broll (the antithesis of a Troll). They are encouraging people to sign up to be a supporter, and by using Thunderclap, a social media amplification tool, they will effectively turn all their supporters into social influencers. They will leverage on supporters’ Facebook, Twitter or Tumblr accounts to send a message of support and positivity on the Internet on 15 March, 2015 at 3pm. For each registered account, Singtel will donate $3, which will go towards organizing a cyber wellness programme for children with special needs. “We hope to flood the Internet with positivity,” said Abigail, another member of the team. What Cassi and the rest of the team behind Brollface is doing is a big effort to bring a huge reminder to the rest of us. The negativity that we’ve grown accustomed to doesn’t need to be a part of Internet culture, and while some of it has become ingrained in us, it doesn’t have to be. All it takes to change someone — maybe an annoying friend — is to point it out and start a meaningful conversation about it. Does Blogger’s Content Policy Change Affect Our Blogosphere?